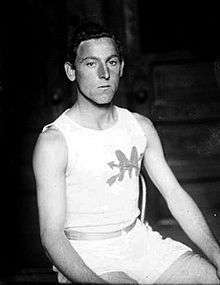 Frederick "Fred" Lorz (June 5, 1884 – February 4, 1914) was an American long distance runner who won the 1905 Boston Marathon. Lorz is also known for his "finish" in the marathon at the 1904 Summer Olympics. Born in New York City, Lorz was reported to have done all his training at night due to his profession as a bricklayer. An announcement in the August 6, 1904 issue of The New York Times indicated that the Metropolitan Association of the Amateur Athletic Union would hold a "special seven-mile race" at Celtic Park on August 13, 1904 with the eight top finishers receiving a paid trip to compete in the marathon at the Olympic Games in St. Louis on August 30, 1904. Lorz, listed as representing the Mohawk Athletic Club, was named as one of 19 "probable competitors" in the event. In the marathon at the 1904 Olympic Games, Lorz stopped running because of exhaustion after nine miles (14.5 km). His manager gave him a lift in his car for the next eleven miles (17.7 km), after which it broke down; Lorz then continued on foot back to the Olympic stadium, where he broke the finishing line tape and was greeted as the winner of the race. Though he initially went along with it, he soon admitted that it was a joke after spectators claimed that he had not run the entire race. Thomas Hicks went on to become the real winner, though he too had an unusual race, walking part of the route and being assisted by strychnine, which has since been banned; among the 32 runners that entered, he was one of several who came near death (along with William Garcia), and he retired the next day. Lorz was banned for life by the Amateur Athletic Union, but was reinstated soon afterwards after he apologized for the stunt and it was found that he had not intended to defraud. He won the Boston Marathon in 1905 with a time of 2:38:25. Lorz was suspended a second time by the Amateur Athletic Union for participating in an unsanctioned meet at the games of the Thomas Jefferson Club at Witzel's Grove, College Point, Long Island, New York on August 23, 1905. His application for reinstatement was denied; he was originally required to wait two years before applying for reinstatement, but he was reinstated in time to run the 1906 Chicago Marathon, where he finished fourth. He finished second at the Yonkers Marathon in 1907, seventh at the Boston Marathon in 1908, sixth at the Empire City Marathon in Yonkers in 1909, and second in another marathon in Boston nine days later. In 1910 he married Dorothy Reilly, and they had three children. Lorz died in 1914 of pneumonia. 1 2 "A New Marathon Champion: Frederick Lorz of the Mohawk Athletic Club of New York Captured the Great Run in an Exciting Contest". Boston Evening Transcript. Boston. April 20, 1905. p. 4. Retrieved February 9, 2011. 1 2 "WILL RUN FOR ST. LOUIS TRIP. Eight Best Men in Race to Go to World's Fair for Big Event." (pdf). The New York Times. New York. August 6, 1904. Retrieved May 14, 2012. ↑ "The Worst of the Modern Olympics Was Held ... ?". Newsday. Retrieved 2004-08-27. ↑ Miller, Mike. 30 August 2004. "Olympics flashback: 1904 marathon a joke of a race". Accessed 8 August 2006. ↑ Gettings, John. FactMonster. "Lorz of the Rings". Accessed 5 August 2006. ↑ Boston Athletic Association. "Past Mens Open Champions". Accessed 25 July 2012. ↑ "Amateur Athletes Disqualified," The New York Times, August 25, 1905, p. 4; "A. A. U. SUSPENDS ATHLETES First Meeting of New Committee -- Irish Runner Disqualified." September 26, 1905, p. 10. ↑ A. A. U. DROPS DISTRICT, MAKING NEW ALLOTMENT; Atlantic Association Expelled at annual Meeting of Delegates. ECKERSALL IS REINSTATED - President Maccabe Arraigns Former Georgetown Sprinter, A. F. Duffey -- Lorz Must Wait Two Years." The New York Times, November 21, 1905, p. 10.